Ya know...I've been anticipating some major disruption this week. (08-08-2011, 05:59 PM)Shadow Wrote: Ya know...I've been anticipating some major disruption this week. It's been sunny dry and in the 80's and 90's, rain is a beautiful thing. Who'd have thought a Finnish Summer would be like this eh? Northern Lights, no, not that kind, the aurora borealis kind, were seen nearby a couple of nights ago. I really should monitor these things more closely. Bummer extraordinaire Kreeper, that can be quite the experience, we've seen some mind blowing things up here, it's a real treat to see it as far South as you are. Here is ta pic. 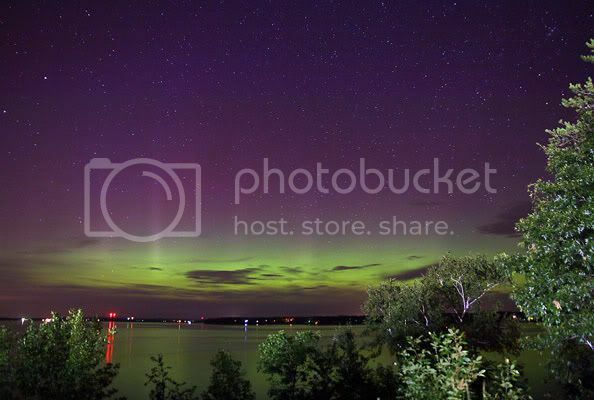 They were taken on the 4th over Lake Wissota. I missed it and I didn't even get stoned! Here is the other kind of Northern Lights. And yes, that really is Northern Lights.